One of the benefits of franchising is that, while they're entrepreneurs, franchisees don't have to operate completely alone. For franchisees who use a franchise coach or consultant when looking into potential franchises, that sense of support comes at an even earlier time. Kevin and Denise Brauer began looking into franchising on their own, with simple Google searches. However, it took teaming up with a franchise consultant to find the right fit – Storm Guard Exterior Restoration. Here's what they've learned. 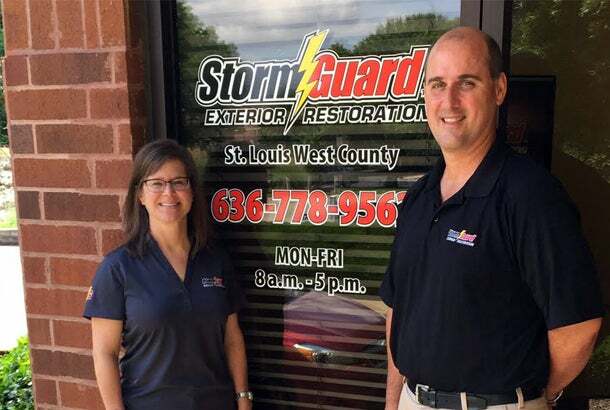 Franchise owned: Storm Guard Exterior Restoration in St. Louis, Mo. We were looking for an opportunity that had the pieces already assembled and built. Building something from scratch was too risky for us and purchasing something existing was very expensive. In a very fragmented market, a larger organization made a lot of sense. I was a sales manager for Print and Web Processing for Tesa Tape. I had worked in corporate America since 1992 with Fastenal Company and Metalcraft Enterprises. Denise was a Radiologic Technologist and Counselor for Drug and Alcohol abuse in grade school through high school classrooms. I began researching franchises on Google, but soon realized I should get some expert advice for such a big decision. That’s when we joined up with Jim Judy. He introduced us to four different concepts that seemed like potential fits for Denise and me. We made a decision to purchase the Storm Guard Exterior Restoration Franchise in St. Louis after working with Jim for about three months. Becoming a small business owner and realizing that we were responsible for everything. The anxiety of taxes and regulations, insurance protection, new employees and policies etc. and so on. It was overwhelming. QuickBooks was a challenge even though I was pretty computer savvy. As a salesperson and manager in my past life, I had to become a business owner and responsible for a P&L while trying to get the sales going. We often joked that I worked for a non-profit organization for the first several months. Do your research. Find a good consultant to help you find a franchise that fits your personality and needs. Having a partner who can dream with you made all the difference in the world for me. Keep focused and follow the program that the franchisor has set forth. There is a reason you bought into the program so believe in it. We expect to open one, maybe two satellite locations to service some of our rural customers. There are several verticals that we have recognized that might make sense. For the immediate future, we have to continue to build our foundation and stick to the competencies that have gotten us to this point. Most of all take time to enjoy every person we help and each milestone the business crosses. Keep our business a passion that never becomes just work!